Robin Lenhart appears to be an ordinary, upper middle-class, suburban homemaker. She lives with her husband Kris, a partner in an upscale law firm, and their twelve-year-old son Nik and ten-year-old daughter Petra in a remodeled farmhouse just outside Leesburg, Virginia. But appearances are deceiving. Robin’s background is not ordinary, and the dissatisfaction that is eroding her marriage of thirteen years feels unique to her. Kris, focused on the next level in his career, spends so much time at work that his role in the family has dwindled to little more than breadwinner. Her children are older and need her less. Robin is yearning for change when two events combine to give her impetus to do more than yearn. Returning from an evening out with women friends from the neighborhood, Robin is injured when another vehicle plows into the vehicle in which the women are riding. Her next-door neighbor and closest friend is killed. A last-minute switch in seating put the neighbor in the front passenger seat that Robin should have occupied. In addition to grief for her friend and survivor’s guilt, Robin is struck powerfully with a reminder of the brevity of life. She is barely out of the hospital when she is offered an unexpected career opportunity, one that will require her extended absence from home. Cecilia is a celebrated singer-songwriter so famous that she is known by a single name. She divides her non-touring time between four homes: a Manhattan brownstone, a high-rise Nashville condo, a contemporary base in Pacific Palisades, and an island sanctuary in Florida. With a brief, unsuccessful marriage in her past, she is single and, despite knowing many people, she trusts very few. A breakdown a few months ago as she was wrapping up a lengthy world tour in Australia forced her to spend two weeks in a Sydney hospital and to give some thought to changes she wants to make in her life. Robin and CeCe are sisters although they are not blood kin. They met in a foster home when CeCe was thirteen and Robin was nine. Assigned to a therapeutic home because of CeCe’s reputation as a troublemaker and Robin’s selective mutism, the two girls bonded. CeCe became Robin’s voice until the younger girl chose to speak again. It was she who gave Robin her name, a name Robin made legal when she turned eighteen. The sisterhood they formed during those years has not been weakened by time or by their very different lifestyles. Although Kris and CeCe dislike one another, Robin and their children think of CeCe as family. When CeCe learns of Robin’s accident, she immediately rushes to her. It is CeCe who offers the understanding and care Robin sorely needs. She also offers Robin a job. Two years ago, an award-winning documentarian approached CeCe about working with him on a documentary about the foster care system. His plan was that CeCe would narrate the film and her story would be a primary focus. She rejected his proposal then, but she has reconsidered and is now deeply involved in the project. She wants Robin, who was a promising photojournalist who earned national exposure before her marriage, to serve as production stills photographer for the documentary and to be there as CeCe explores devastating experiences from her past. Robin sees the offer as a means of claiming a life for herself, one that allows her to use her talents, and as a way to force Kris to become involved in the lives of his children. As the documentary takes shape, bonds are tested, secrets are revealed, and in a ripple effect, the lives of all those involved are changed forever. Emilie Richards excels at giving her readers a multi-faceted view of women’s lives in all their complexities. She does so again in this book that explores the past and the present of two very different women who are connected by a fierce love and loyalty as intense as any blood tie. Robin describes CeCe as her “anchor” in the opening chapter, and CeCe displays the maternal protector role that is often part of the older sister role when she rushes from Arizona to the Virginia hospital where Robin is and uses her clout to see that Robin gets what she needs. 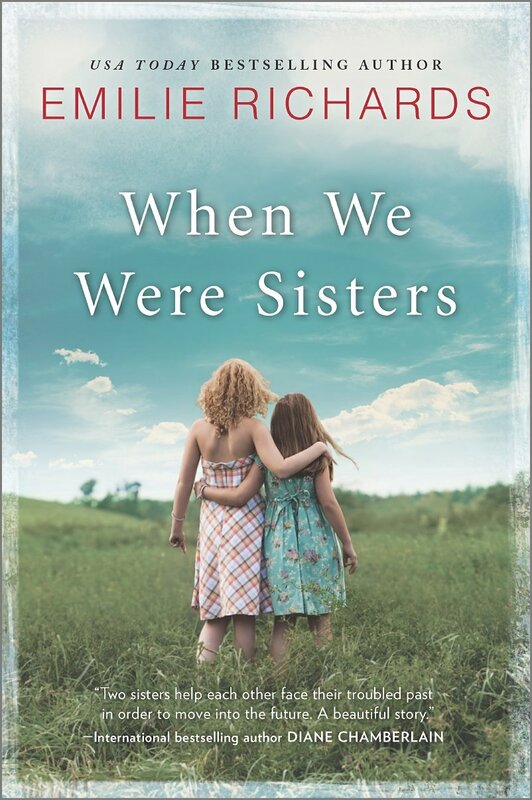 The novel encompasses their relationships with the men in their lives and the role of mother as part of their identity, but the focus is on sisterhood. In the book’s opening sentence, Robin says, “The stories of our lives can be told in so many ways, but no one account, no matter how carefully rendered, is completely true.” The structure of the book with alternating narrators and multiple perspectives supports that initial claim. The first-person accounts provide a sense of immediacy and an intimate connection with the central characters. Richards is wise to include Kris’s point of view. Thus, a character who in the hands of a less gifted writer could have been just another self-absorbed jerk becomes a flawed and fascinating character with layers to his personality. 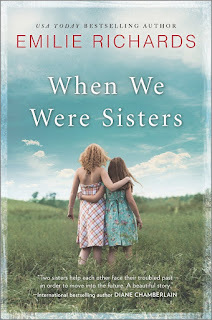 Although While We Were Sisters is women’s fiction rather than contemporary romance, Richards is still at heart a writer of love stories, and the love includes romance as well as love’s other faces. The relationship between Robin and Kris and between CeCe and her manager Donny will satisfy readers who need romance, and other relationships expand the view of a woman’s world. I found Nik and Pet interesting and realistic, and I particularly appreciated the inclusion of Kris’s family. Credibly imperfect, they, in their love for one another, provide needed balance to the grimness of the families of Robin and CeCe. Emilie Richards has long had a place on my favorite-authors list. I’m adding While We Were Sisters to my collection of keepers by this author, a collection with books that date back to the 80s when she was writing small gems in category romance. And I eagerly await her next book. Great review Janga. On Saturday I turned her playlist on. There were only a couple of artists I didn't know. Already have on my TBR list. Thanks, Pamela. I hope you enjoy it. I always find playlists interesting, but this one seemed a particularly good fit for the book. Secrets, lies, guilt, hard heartedness, cruelty and deep hurt on one hand, - revelation, love, forgiveness, standing for self, owning the real self and trust in the other. And very importantly - the rights of children to safety, care and love. The kind of book I totally love, placing it on my Keeper's Shelf!